Teach your students how to tackle poetry step-by-step! 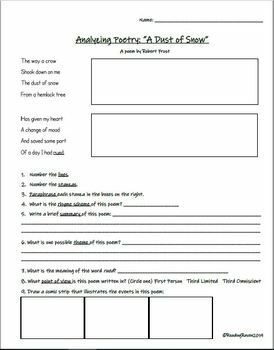 This worksheet provides the framework and practice for students to be able to break poems down into manageable parts. 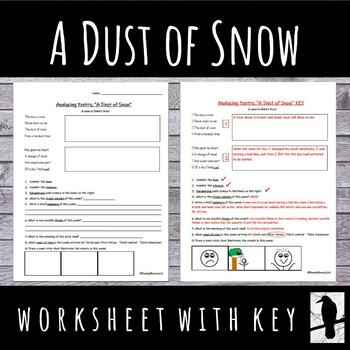 Students will analyze the poem "A Dust of Snow" by Robert Frost and answer questions to assess their knowledge of common poetic conventions. 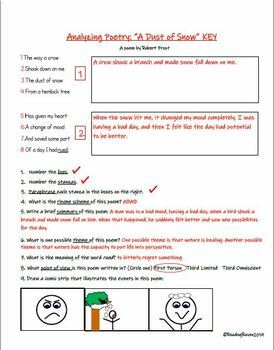 This worksheet includes the following key terms: line, stanza, paraphrase, rhyme scheme, summary, theme, and point-of-view.